Quality reproduction of stock timing/oil tank plug in an over size thread version with a 3/4" hex head. For use with tanks with stripped out threads that are capable of cleaning up to an 11/16" X 16 thread pitch. 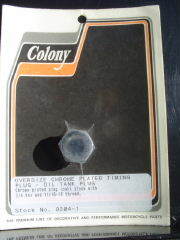 Colony Stock #'s 9304-1 and 9404-1.